Monnaie de Paris wished to pay tribute to one of the most famous characters of comic strips. The main characters of this comic strip are Asterix, the warrior, and Obelix the menhir deliverer. 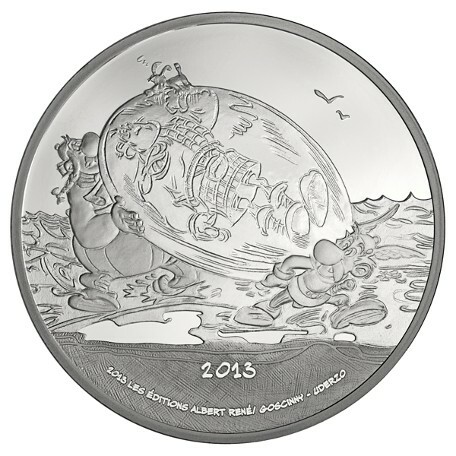 The obverse depicts Asterix and Obelix carrying the Scottish hero Mc Oloch confined in a block of ice. The reverse resumes the famous drawing that we can discover at the beginning of all album of Asterix: the village of inflexible Gauls surrounded with the camps of Roman legionaries seen through a magnifying glass. This entry was posted in Euro Coins, Euro Coins Silver and tagged 10 Euro, 2013, France, Proof, Silver by Electa. Bookmark the permalink.